SARAJEVO, Bosnia - Landslides triggered by unprecedented rains in Bosnia have left hundreds of people homeless, officials said Sunday, while thousands more have fled their homes in neighboring Croatia and Serbia as Balkan countries battle the region's worst flooding since modern records began. Throughout hilly Bosnia, floods are triggering landslides covering roads, homes and whole villages. About 300 landslides have been reported, and stranded villagers often are being rescued by helicopter. Three months' worth of rain fell on the region in a three-day burst, creating the worst floods since rainfall measurements began 120 years ago. Observed from the air, almost a third of Bosnia chiefly in the northeast resembles a huge muddy lake, with houses, roads and rail lines submerged. Officials say about a million people — more than a quarter of the country's population — live in the worst-affected areas. While water levels are receding in some parts of Bosnia, land flanking the Sava River remains submerged. Hundreds of people have been plucked by rescue helicopters from flooded towns and villages. An estimated 10,000 people have been forced from their homes in flooded villages around the eastern town of Bijeljina, where the Sava River broke through defenses Saturday. In the east of neighboring Croatia, two people are missing and hundreds have fled their homes as the Sava River also breached flood barriers there. In Serbia, more than 20,000 people have been forced from their homes. Officials there fear more flooding later Sunday as floodwaters travel down the Sava and reach the country. Serbian officials said that the flood wave might be lower than initially expected, because the river broke barriers upstream in Croatia and Bosnia. Experts said they expect Sava floodwaters to rise for two more days, then subside. "What happened to us happens not once in 100 years, but once in 1,000 years," Serbian Prime Minister Aleksandar Vucic said at a government meeting broadcast live on Serbian television. 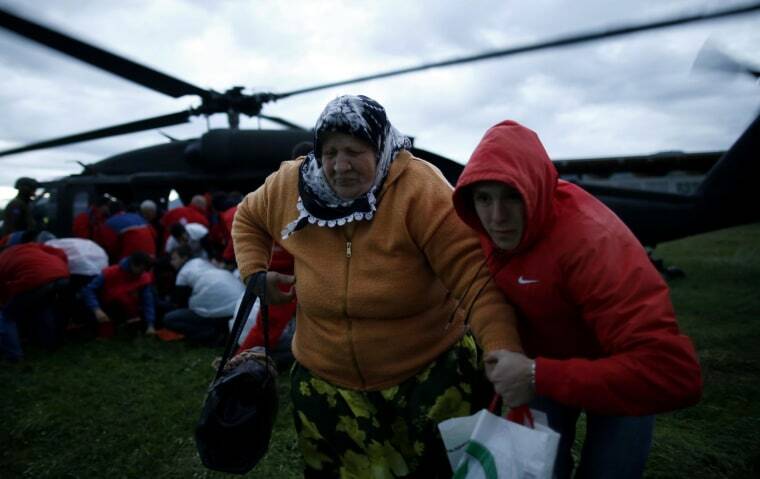 At least 25 people have died in the Balkan floods.